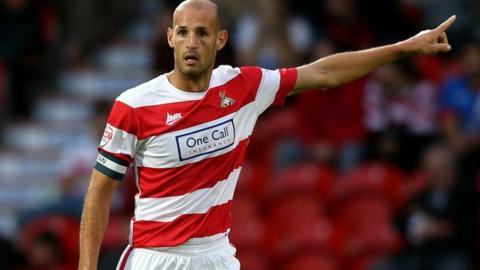 Doncaster defender Rob Jones is the "perfect man" to become caretaker boss, says goalkeeper Thorsten Stuckmann. Jones, 35, has been put in temporary charge of the team after Paul Dickov was sacked on Tuesday. "He is the perfect man now for us. He has a clear idea for how he wants us to play," German Stuckmann told BBC Radio Sheffield. "I've only known Rob for a few weeks but he has a natural authority and he is a straight talker." He added: "He has the respect and the confidence of the dressing room. Everyone will be behind him and we have to support him as much as we can." Rovers are currently 17th in League One with six points from six matches, having won just once in the league this season. Meanwhile, Jones said he was content with how the team had responded to the change in management. "The players know what is required of them and they know what I expect," the former Scunthorpe and Sheffield Wednesday man added. "It's been a great first training session and I have a good bunch of players who I have the utmost respect for. I am delighted to be in this position." Jones confirmed he would not play at Walsall on Saturday as he is still recovering from a neck injury.